You've heard of the last supper, well now we are going to discuss the first supper. That is to say the first meal your chef ever made for you. Was he a cook? A chef? Was even in culinary school? Did you like it? Did you run to the bathroom screaming? Did you sell the recipe to Kraft and make a fortune? I wish I could say I remember my "first meal" cooked by my chefhusband. We started dating in high school so we shared many other firsts, just not a meal. When I first met him he wanted to be a musician: a drummer. But he eventually turned away from that lifestyle because he was fearful of the schedule and low pay. AND LOOK AT US NOW! HA, HA, HA. Oh well. I will however share with a picture of my last meal cooked by him. It was at Perry St. last week with my family, this picture shows the snapper and radish plate. I'm not a foodie so those are all the details you'll be getting unless you've got a Perry St. menu to reference. I am planning a DCW get together soon (a Saturday night) for us ladies to meet up and chirp. I'll keep you posted on the date, time, and place. Labels: eating out, Perry St. I will try my best not to throw out that kind remark...but its not my favorite picture. I look like I'm 12! And BB....getting steaming w/ the fireplace talk! It definitely would have been something he grilled @ my parents' house, when he & I first started dating. Unless you count culinary school, and in that case, it would have been a family meal! Chefwife, you look amazing! Would like a close-up on the food however since I am a *gasp* "foodie"! Chefwife, your posts are wonderful! What a fun way to connect with other women... not too many know the things we go through, good, bad, and great. 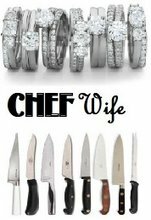 And you've brought up such an interesting question, this is something every chef wife or girlfriend will have a fun answer to. ...it was an extravagant seafood platter then something delightfully chocolate for dessert, made at the restaurant where he works. I worked there too, and one night as I was about to leave, he just presented me with dinner, which shocked the hell outta me, and the rest is history...! when i first met my chef and he told me he wanted to make me dinner, i honestly was a bit nervous. i think most people would get excited to have a meal made for them in the comfort of their home by a chef. but all i could think was, "i really like this guy. what if his food turns out to be horrible? how am i going to continue to see him if this guy really could NOT cook?!" but thankfully, the first meal he made me was extraordinary. a giant prawn on a parmesan crusted crostini, a big hearty juicy steak, a corn and morel mushroom ragout, roasted herb potatoes, and a lemon whip with fresh berries and chocolate covered cookies. 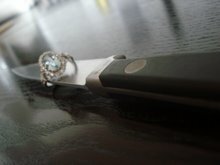 he definitely turned out to be a keeper =) DCW_NYC, i absolutely love this blog of yours. its nice to know that other people also experience the late nights, holidays without the chef, and dealing with the love of saran wrap. a wonderful thing you started here! It was our 5th date and he invited me to his apt for a fish dinner. He had graduated culinary school by then and was working at his first permanent job (after a few internships at various restaurants around the city). I love when he cooks for me because he gets so excited and the presentation is important, everything's arranged on the plate just so. 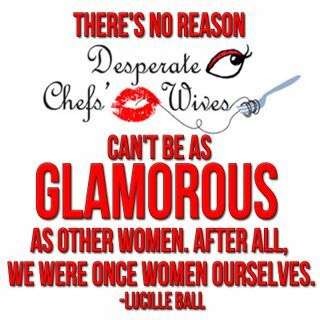 I love your blog, chefwife. I'm the girlfriend of a chef. My guy works in catering and doesn't always have to work holidays (he was off T-Giving and will be off on X-mas), but the long, busy hours and usually no weekends together is a challenge.